Annabelle celebrating 3 weeks old!!! Well, Annabelle will be 3 weeks old later tonight. So Happy 3 week birthday to her!!! She woke up good for me this morning and was looking all around, which is REALLY good. Her color is pretty good as well! They are planning on reinserting a drainage tube (had fallen out quite a few days ago) because her stomach cavity is bloated with too much fluid and they are afraid of it pushing on her lungs. It is already pushing on her actual stomach, as evidenced by the bile she threw up this morning. They’ve also stopped her feeds and put her back on IV nutrition, which is another step backwards. *sigh* I’m trying my best not to be frustrated. I KNOW ups and downs are normal, but it just feels like all the really good headway we’ve made over the last week is now all being reversed. I’ll be honest, I’m a bit (okay, quiet a bit) discouraged. BUT. I am thankful she is doing as good as she is. I talk occasionally to other parents/grandparents and some of the sob stories are gut-wrenching. One little girl had to go immediately back on the ventilator because she didn’t take being off it at all, one little boy isn’t doing so well with his surgery so is on the heart transplant list, and another little girl is having a lot of struggles with her 2nd surgery (the one Annabelle will have in a few months.) 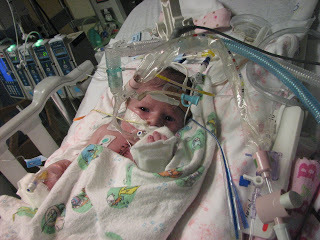 I look at Annabelle and am SO thankful that she’s opening her eyes, that even though we have setbacks, that her surgery has gone technically well. And I DID get to hold her the other day, as brief as it was. SO today, on Annabelle’s 3 week birthday, I’m going to try and concentrate on counting my blessings in spite of the not-so-great stuff. Oh, and here are a few pictures of her from this morning with her little peepers open!! Oh, also notice that she graduated over the weekend to a BIG girl bed. 🙂 I like it MUCH better because I can lean over and snuggle a little bit and give her kisses easier. VERY important stuff! she's adorable!! I love her little eyes peeking out. They look so cute 🙂 give her a snuggle for me – still praying!! Love, Love those little peepers! Happy 3 weeks, Beautiful Child. She's so precious. I can't wait to be able to come see her. Still praying… Love ya, KP! Krista, thanks for the peek at your adorable daughter. Still praying for all of you. This may be a roller coaster ride, but God is the seat belt and He never lets go. Krista, she is adorable. To me, it seems that there's more recognition dawning. Praying for you and for Annabelle, that there will be an improvement that will cheer your spirits today. She is SOOOOO precious!!! I laid my hand on her on the computer screen and PRAYED for more forward progress!!! HE is the great healer!!! Give her a kiss for me!!! Huge congrats! Anabelle is beautiful! She is so precious. I'm glad I read this post because it has reminded me to continue praying for you and your daughter. God bless. What a cutie! You will be holding and snuggling with her soon. Be blessed and know God hears the faintest cry. So sweet! That last picture looks like she's motioning you to come closer, like she has a secret. Continuing to pray for her (and your peace of mind!). Father God, Thank you for blessing Krista and her husband with Annabelle. You are so good to match us with the perfect children for our families. Lord, we ask that you would be with Krista and her entire family right now. We thank you that Anabelle is looking good, that she is getting her color back. We pray for the insertion of the tube. 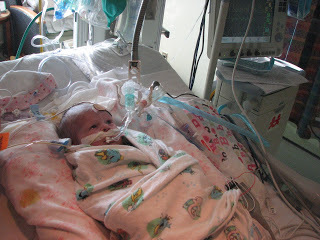 We ask that you would be with Annabelle and comfort her as the doctors put the tube in. Father, help her to feel your arms wrapped around her. 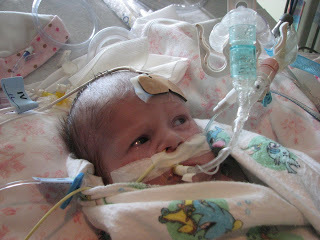 We pray for a quick healing and recovery, Lord willing that she would be able to eat without the tubes. Strengthen Krista and her husband for the challenges and decisions they face each day. Help them to take everything one day at a timne, rejoicing for the blessings of the day and praying for your strength. Fill them to overflowing where they are empty, Father. Strengthen them to minister to Anabelle and the rest of their family. Give them the physical and spiritual rest they need right now. Help them to feel your presence and use this time to grow them closer to each other and to you. In Jesus Name, Amen. I am sooo Glad it it close to my weekly visit! I miss my Annabelle! She looks sooo beautiful! I love that little stuffer!